With a Russian/Dutch heart: Cold, please go away! Yes, it has been cold the last few days. At least, we think it is cold At night it freezes in our area, a 3C degrees, daytime we just crfeep up till 0 or 1C , and I know there are readers among you that smile reading these temperatures. yes, there are people living in temperatures much colder and with lots of snow etc,etc Just can say I am glad i am not living in those parts of the world LOL. Still it is feeling rather cold. I went out yesterday, had to go to the market and was glad i wrapped myself up in a long warm coat and hat and gloves, because that was needed. There wasn;t almost any sun to see like we have today, which also makes a little difference. When you walk in the cold but on the sunny side of the street you can already feel a bit the warmth of the sun. Oh, it is a teaser, because spring temperatures are still far away. Nothing much is happening here these days, and it is so wonderful. Jan is getting better and better from his cold, not yet completely gone and he had an attack of sleep the day before yesterday. He isn;t already a good sleeper, but because of the cold it is even harder to sleep, specially at nigh. So the day before yesterday he already slept long in the morning, woke up, did some tv watching and cross word puzzling, then in the afternoon took a little nap, then had dinner and then after being lying on the couch for half an hour just went to bed to sleep. Gosh, he really slept for hours again, woke up late evening, had something to drink and after an hour or two went again to bed and slept again. I guess you can say he just needed a real catch up. never mind, it did him good. Our Brodski is in the house and specially the living room a lot lately. Probably he find it too cold outside too So when he needs to do his business, he runs out the little catgate, does whatever he needs to do and comes back quickly and then sits in the room at all different places. Sometimes very handy in the middle of the room, so we have to be careful if we walk there LOL, but also on the chair, or in the evening on the couch between Jan and me. all warm, safe and cosy . I think I will take a real easy day today. Yesterday I went out, to the market and supermarket, so have about all we need for the weekend. Okay I might do something in the house but I am not extremely motivated at the moment LOL! Okay, I will get busy later today, I just first will take something to eat and then we'll have a coffee and perhaps then will think about the mischief I can get into. It is nice to have sometimes a day, when it doesn;t matter all too much what you do or don;t do. 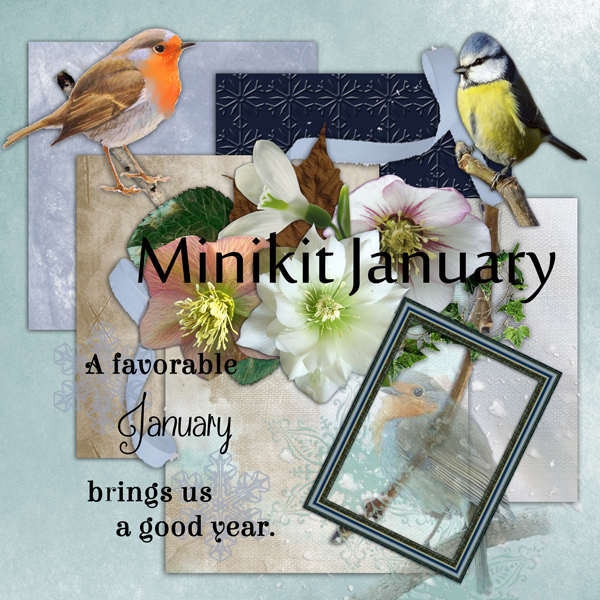 That's about all for now, so I will finish and give you a small kit, a minikit, named January. I am hooping to make a mini kit for every month of the year. 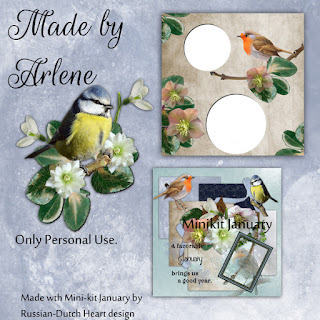 I give you Arlene;s cluster and quickpage at the same time. Have a wonderful day and good week ahead! I'm so glad to hear that Jan is feeling so much better. Catching up on lost sleep can be tricky. Sometimes we just need to sleep away a day or two. This morning the ground is covered with a light layer of snow. Hmmm, it must have happened while we were asleep. Hopefully, it will be all gone in a few hours. I'm just not into snow anymore. I love your little kit, and especially the little birds. Arlene's cluster is beautiful too. The little birds make it seem like Spring and hope are right around the corner. Now I must make my own post and get busy here. You have a wonderful day my friend, hugs, Edna B.
I love to see those colourful birds at this time of the year. Makes me think that spring isn't too terribly far off. What a great idea to have a mini kit each month. I love your work and look forward to your posts and gifts. Thanks so much once again. I participate in a monthly calendar challenge for 2018 and my theme this year is going to be birds so I will for sure be able to use your little minis!! These birds are so sweet! Thank you for sharing. Thanks for fixing the link. Nobody wants to miss any of your creations! Thanks for the new mini kit. Love the Birdies! Am still working on my disability claims...now I have 2 going on. Not doing too much scrap booking. Don't have any new pictures. But I'll get up the ones I have accomplished on the blog real soon. I have done quite a bit of coloring since I'm having to sit in my recliner with the feet up in the air for the circulation problem. Will be looking at getting a laptop so I can keep up with it on my lap and the WiFi that comes with my internet. So glad to hear that Jan was able to sleep as he really must need it to heal. I know that catching up on missed sleep is not at all easy when missed out on. I am glad to hear that he is feeling better. I am sorry to hear that it is so cold there. We haven't had a really cold winter here at this point but I have gotten spoiled to the mild winters. We had some wind and I am not a fan of wind but at least it was gone pretty fast. I will have to try to download your new kit tomorrow. I have tried several times and cannot get it to download and I don't think that it is your link. I think that it must be my computer. Sometimes I do have a terrible time downloading anything!